At first glance, the title seems absurd. But there’s a surprising and very real connection between George Lucas’s cinematic masterpiece and the thirty-seven (give or take) plays of William Shakespeare. That connection is a man named Joseph Campbell, author of the landmark book The Hero with a Thousand Faces. As anyone who has read Campbell’s book can tell you, Doescher ain’t making it up. Campbell himself uses Star Wars as an example of the heroic cycle in his later book-slash-PBS miniseries, The Power of Myth. And, Doescher says, there’s a good reason for that: Lucas read Hero while he was rewriting Star Wars and realized his story mostly fit the mold, so he tweaked the final script to include what he’d learned from Campbell’s book. But I digress. Maybe you have to be a Shakespeare fan to appreciate it, but I found Doescher’s book to be chock full of fantastic moments. All the iconic moments are present, albeit in a slightly twisted form, and Doescher even gets in a few in-jokes. I’m tempted to tell you how he treats the whole Han-Greedo scene, but I won’t spoil the fun. Suffice it to say, it made me laugh aloud—and it wasn’t the first nor last time. One thing that never got old for me was reading R2-D2 translated into iambic pentameter—not only his beeps and whistles, but his asides. Yes, R2 gets to talk to the audience. And it’s fantastic. I enjoyed the book so much that I sent a message to the Cincinnati Shakespeare Company, which does amazing productions of Shakespeare’s work (and other plays), and asked them to stage it. I hope they do, or that someone within driving distance does. It wouldn’t be easy, but oh my, would it be worth it. 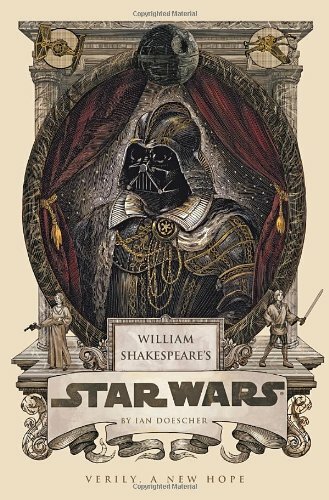 If you’re looking for something fun and different and quick, pick up William Shakespeare’s Star Wars . And may the Force be with thee. That sounds super interesting. I love Star Wars and Shakespeare, so it’s right up my alley. 🙂 Thanks for sharing this! You’re welcome! It definitely sounds like something you’ll enjoy. You are currently reading Writing about Reading: William Shakespeare’s Star Wars at Kicking the Pants.